Heat emissions from the body can provide an accurate diagnostic window for early signs of breast cancer or heart disease. A nontoxic, highly accurate, and inexpensive form of diagnostic imaging does exist and has been used by progressive physicians in the U.S. and Europe since 1962. Called thermography, it’s based on infrared heat emissions from targeted regions of the body. Are there other ways of examining breasts for signs of cancer than mammography? As the body’s cells go through their energy conversion processes, called metabolism, they emit heat. Thermography is able to register these heat emissions, display them on a computer monitor, and thereby provide a diagnostic window into the functional physiologic status of a given body area, such as the female breast. At present, there are perhaps 1,000 thermography devices in the U.S. for providing this detailed, clinically valuable information. For breast cancer, thermography offers a very early warning system, often able to pinpoint a cancer process five years before it would be detectable by mammography. Most breast tumors have been growing slowly for up to 20 years before they are found by typical diagnostic techniques. Thermography can detect cancers when they are at a minute physical stage of development, when it is still relatively easy to halt and reverse the progression of the cancer. The procedure is simple and non-invasive. The woman stands bare chested about 10 feet from the device; the imaging takes only a matter of minutes, as results are displayed instantaneously on the monitor; and generally the data can be rapidly interpreted with the assistance of sophisticated image analyzing software. No rays of any kind enter the patient’s body; there is no pain or compressing of the breasts as in a mammogram. Thermography is thus a breast-friendly procedure, and its widespread use could save many women from the development of breast cancer and/or highly traumatic surgery and radiation treatments later. Mammography has multiple drawbacks and many women are beginning to realize this despite the pressure of conventional radiologists to insist on more screenings at increasingly earlier ages. Mammography is uncomfortable, at times even painful for women, as their breasts are held in a vise during the screening. Mammography is only 40% to 60% accurate for pre menopausal women or for menopausal women taking synthetic hormones. It is also considerably inaccurate for women with large breasts. Mammography is at its best for postmenopausal women, for whom it has an 81 % accuracy rate. One study found that self-examination was responsible for a greater percentage of cancer discovery than mammograms. A 1996 survey of 281 women by Breast Cancer Action in San Francisco, California, revealed that of the 226 women (of whom 70% were between the ages of 40 and 59) who had breast cancer, 44% discovered this through breast self-exam, 37% through mammograms, and 8% through a physician’s exam. Perhaps most damning, mammography exposes the breast to damaging radiation. Based on 40 years of studying the effects of low-dose radiation on humans, John W. Gofman, M.D., Ph.D., an authority on the health effects of ionizing radiation, estimates that 75% of breast cancer could be prevented by avoiding or minimizing exposure to the ionizing radiation from mammography, X rays, and other medical sources. A serious drawback of mammography is the high incidence of “false negative” results. This means the test indicates there is no cancer in the breast when there actually is; unfortunately, the woman may discover the breast cancer in progress only later when the time for early intervention has already passed. Similarly, fibrocystic breast tissue can be mistaken for tumors and lead to unnecessary biopsies. Perhaps 25% to 30% of women have fibrocystic lumps in their breasts; conventional doctors, worrying about mal-practice suits for failing to diagnose cancer, can construe every fibrocystic lump as cancerous and order a rash of biopsies. The biopsy itself is injurious to healthy breast tissue. Mammography is contraindicated for women with breast augmentation (silicone or saline implants). The trouble here is twofold: the implant obscures a fair amount of otherwise imageable breast tissue and the mammography procedure itself can potentially damage the implants, producing leakage. With its errors, false negatives, and radiation exposure, mammography is not an acceptable way of screening breasts; the only reason it’s tolerated is that it is a major source of steady income for radiologists. They have come to covet mammography and want no competition from other approaches. Meanwhile the incidence of breast cancer continues to rise. Currently, one in eight women will get the disease. It was one in twelve in 1971-when we began thermography imaging-and it is occurring in ever younger women. Once women start making demands on their physicians for a different imaging approach, thermography can become the preferred initial screening method. Then mammography will be used only as needed to pinpoint the precise location of breast tumors. In contrast, thermography is 86% to 96% accurate for indicating cancer in pre menopausal women. When there is a mistake with thermography, it is almost never a false negative, but rather a false positive. That means our interpretation of the thermography imaging led us to suspect a cancer process when in fact there was none. Further, while mammography tends to lose effectiveness with dense breast tissue, thermography works independently of varied tissue densities. For this reason, it is especially useful for screening younger women (who typically have denser breast tissue). From the viewpoint of thermography, the body is like a walking beacon-we glow in infrared. The glow is based on heat emissions from our tissues as they convert (metabolize) food into energy and as the energy is picked up by the blood circulation. Our circulatory system acts as a giant radiator to distribute and equalize body heat derived from metabolism. The thermographic image shows us areas of diminished energy flow. In addition to hypervascularity of blood vessels, cancerous growths tend to give off more infrared energy. That’s because cancer itself is by definition an uncontrolled growth; it can’t use its energy as efficiently as other cells in the body. This lack of energy efficiency in a cancerous growth, added to the inflammation of surrounding tissues-a result of the body’s natural immune reaction against a cancerous mass-helps to emphasize the difference in infrared energy between cancer cells and healthy cells and thereby to accurately pinpoint the tumor process. The inflammation itself, produced by breast tissue injury from the tumor, gives off excess heat. 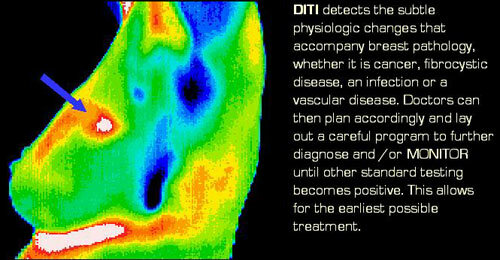 Through thermography, we can tell if a blood vessel is unusually large, has a complex structure, or has a high degree of blood flow. If the energy flow pattern (vascularity) in one breast is higher than the other breast (usually by at least 1.5°c), this is a warning sign. Typically, five irregularities are screened for as indicators of a cancer process, but generally if even two of these are present, then we are about 96% certain there is cancer. At this point, mammography can be useful for refining the diagnosis and precisely indicating the location and size of the breast tumor.